Juno Mission ready for launch! I started out the year continuing to work as lead developer for Empower Campaigns. I was fortunate enough to attend the NASA Ames Tweetup on "Planet Hunting". There I heard from a number of great speakers, but the standout one to me was the Kepler Mission's co-investigator Natalie Batalha. Not only is Kepler a fascinating mission (that ended up having a stellar year), but Batalha is a remarkably passionate and inspiring speaker. The event also included a tour of the research center, which was fascinating. I also wrote about PHP step debugging in VIM. I wrote about organizing PHP batch jobs and also serving static content efficiently from an application. March also included my attendance of the NASA Sun Earth Day Tweetup at Goddard Space Flight Center. It was a blast to tour Goddard! Since the event was in the the DC area, I was able to visit family and attend my youngest niece's second birthday party. The month wrapped up with a trip to New Orleans for the state-side wedding reception of my sister in law, who was married in New Zealand the previous November. On Easter I made this. You're welcome. In early May I decided to take the plunge in electric cars and reserved a Nissan Leaf. The wait was expected to be 4 months. Though it wasn't a NASA Tweetup, I did make it down to JPL's annual open house in mid May, which was a bit crowded, but still spectacular. I got to see the Mars rover Curiosity in a clean room before its launch the following November. I also got to walk through the Space Flight Operations Center. I wrote about working with Kestrel from a PHP application since there didn't seem to be any other documentation on the topic. We also ran into some further plumbing issues at home that month, but decided to tackle the problem ourselves. In June my wife and I celebrated our 4th wedding anniversary! We also documented another small home repair, replacing the garbage disposal. July included a second trip back to VA, this time just to visit family. Unfortunately, soon after that we got the bad news that one of our beloved cats, Linus, suffers from chronic kidney disease. He's currently doing well at a stable weight (roughly 3/4 of his previous weight) through medication and diet, and we're hoping to keep him as comfortable as possible. There is not a known cure. I also finally broke down and bought my first serious telescope, a Celestron NexStar 8SE. It's pretty rad. I'm hoping to get into astrophotography this year. 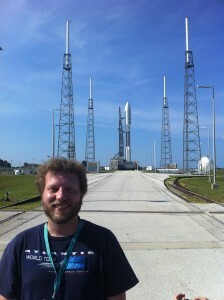 In August I was lucky enough to attend the launch of NASA's Juno mission during my 3rd tweetup of the year. We heard from lots of great folks on the Juno teams as well as NASA Administrator Charles Bolden, who was a really inspiring speaker. Later that month, a book that myself and a few other former Digg employees contributed to nearly 2 years before finally came out. That month I attended my first TEDxNASA event "Extreme Green", which was a blast. Lots of great speakers. One of the more impressive talks of the day was Ed Lu's talk about how inexpensive it really would be to set up an asteroid monitoring system to help prevent a major collision, perhaps the worst natural disaster imaginable. Another TED talk on 30 day challenges inspired me to try cutting out Diet Coke (and all sodas) for 30 days. Four and a half months later, I still haven't gone back. I bough my first 100% electric car, a Nissan Leaf, which was delivered right on schedule. The car is such a dream to drive. It's nearly silent. I can't wait until electric vehicles are the norm! Later that month I wrote about speeding up satellite predictions in PHP with hiphop which coincided with my release of Predict, a library for modeling and predicting satellite orbits. The use case for this is a project of mine called "Where the ISS at? ", which is currently in the beta testing phase and should be public very soon. October included attending my final NASA Tweetup of the year, the SOFIA Telescope Tweetup back at NASA Ames. We got a chance to tour the telescope, which was parked there at Ames. It too was pretty rad. In November we decided to take a third trip back to VA for Thanksgiving, and I finally got a chance to visit Monticello. 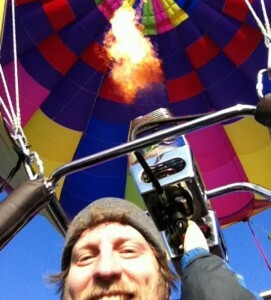 Hot Air Balloon Ride in Sonoma! December saw us both reaching our 40th birthdays. For some reason, I kind of dreaded this milestone. But once I reached it, I was actually pretty relieved. It seems the anticipation of turning 40 was much worse than the actual birthday. The good news is that my wife arranged our first ride in a hot air balloon up in Sonoma to celebrate. Once you got used to the sound and awesome heat of each of the 15 million BTU burners powering the balloon, the views were nothing short of breathtaking. In December I also accepted a job as Engineering Manager at OpenDNS, something I'm very excited start in the beginning of January. Yay! More balloon and kitty cat pictures!! !